To go pick blueberries I have to get up at four in the morning. First I make my lunch to take with me, and then I get dressed for work. For lunch I eat whatever there is in the house, mostly bean tacos. Then the ritero, the person who gives me a ride to work, picks me up at twenty minutes to five. I work as long as my body can take it, usually until 2: 30 in the afternoon. Then the rutero [route driver] gives me a ride home and I get there by 3:30 or 4 in the afternoon. By then I’m really tired. I pay eight dollars each way, to get to work and back home. Right now they’re paying six dollars for each bucket of blueberries you pick, so I have to fill almost three buckets just to cover my daily ride. The contractor I work for, Elias Hernández, hooks us up with the riteros. He’s the contractor for fifty of us farm workers picking blueberries, and I met him when a friend of my aunt gave me his number. I’ve known Elias two years now, since the first time we worked putting plastic on the grape vines. On that job, which lasts a month, we put pieces of plastic over the vines so that it looks like an igloo. They do this so the grapes won’t burn from the frost. The grapes are almost ready to pick when we do this, but we don’t pick them. Other people come after us to do that. I pick grapes for raisins or wine with another contractor. I’ve worked with many contractors doing many different jobs. Sometimes I work a lot with the same contractor, but sometimes it changes — it depends on how they treat me. I also try to find work that’s easier. To me the contractors are all the same, but some treat us better than others, so I go with them. I try to find work that will allow me to make enough to pay for my lunch, ride and rent. I have a daughter, Liliana, who’s four, so I also have to make enough to pay for the babysitter. That’s why I’m picking blueberries – to support her. I pay the babysitter eight dollars a day, but when my aunt isn’t working, she takes care of Liliana. My daughter’s still asleep when I go to work, because we leave so early. We start working at six, so I sleep on the way myself, and wake up when we get to the field. There the contractor gives us our buckets and we wash our hands before picking the fruit. The job isn’t that difficult, and I love seeing the buckets fill up. Right now there are a lot of blueberries on the plants, so we can make more buckets. Sometimes we return to a field as many as four times. First we pick the ripe blueberries and then go back, because the green ones continue to ripen with the heat. Each bucket has to weigh twelve pounds. This is the second year I’ve picked blueberries, so since I don’t have much experience I can only fill fifteen or sixteen buckets. When the ripe fruit is scarce, I can only pick thirteen. Those with more experience can do up to twenty buckets a day. To pick a lot, you have to skip your lunch break. After a day of picking blueberries, my hands feel tired and dirty and mistreated. We immediately wash them with cold water, but later they hurt a lot. They don’t give us gloves because they say they will damage the fruit. 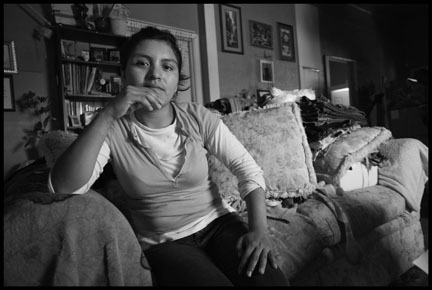 READ THE ENTIRE STORY HERE: David Bacon: The Story of a Oaxacan Indigenous Farm Worker Woman | mexmigration: History and Politics of Mexican Immigration.